Tunisia Pushes Out Its Strongman: Could Other Arab Countries Follow? All revolutions are impossible, Leon Trotsky once said, until they become inevitable. That transformation was completed in a flash in Tunisia on Friday, Jan. 14, as the country's authoritarian President Zine el Abidine Ben Ali fled the country in the face of a protest movement, demanding jobs and democracy, that violent repression had failed to quell. After trying to calm the nearly monthlong protest wave by promising economic and political reform and democratic change, Ben Ali went a step further on Friday by dissolving his government and calling early parliamentary elections in six months. The rioting raged on, however, and by Friday afternoon Ben Ali had declared a state of emergency. But reports from the streets of Tunis suggested that many soldiers and policemen had crossed over and embraced the protesters. And by day's end, news organizations were confirming that Ben Ali had fled the government, leaving the military and Prime Minister Mohamed Ghannouchi in charge. But the nature of the political changes to come remains unclear  one key difference between Tunisia and revolutions of the type envisaged by Trotsky is that two decades of Ben Ali's relentless repression of political opposition have left few, if any, credible forces ready to step up and run the country. The transformation of what began in mid-December as a wave of protests over employment and living conditions into a direct challenge of Ben Ali's strong-arm regime was acknowledged in the President's speech on Thursday, Jan. 13. In addition to promising cuts in the skyrocketing prices of milk, bread and sugar, the President stated he would not run for re-election. This followed his announcements on Tuesday that he was firing his Interior Minister and promising to free people arrested during the spreading wave of demonstrations. With at least two deaths reported during clashes in Tunis on Thursday morning  on top of a death toll officials had previously placed at 23, vs. the more than 60 deaths cited by humanitarian groups  Ben Ali said Thursday night he had ordered troops to stop using live ammunition to break up protests. Opposition groups applaud the moves but remain wary of an authoritarian leader actually paving the way for greater plurality. "It is very good that he has promised not to run in the election, [which] is something we have asked for for a long time," Najib Chebbi, leader of Tunisia's main opposition, the Progressive Democratic Party, told Reuters. "[These announcements] correspond to the expectations of civil society and the opposition ... We await to see them [applied] in concrete detail." Ben Ali's heavy-handed repression of opposition during his 23-year rule has made the difficulty of replacing him as significant as the desire to see it done. "There really is no single party or individual who could credibly step up and take over," says Karim Emile Bitar, a specialist on the Middle East and Arab world at the Institute of International and Strategic Relations in Paris. But should they go ahead, the newly called parliamentary elections could go some way toward Tunisia's living up to what Bitar says is its reputation in the Arab world as a "trailblazer" of progress. He notes that Tunisia led Arab countries in obtaining independence and then building a relatively strong economy. It has also developed a large, well-educated middle class and a progressive society featuring an emancipated role for women  all of which are fueling the current protest movement. The rest of the Arab world, Bitar says, is now watching to see if Tunisia will lead the way toward greater democracy too. 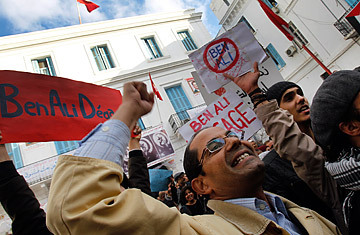 "Like in most Arab countries, the push for change in Tunisia is being led by a large population of young, educated people who no longer accept the trade-off of economic stability in exchange for political repression  they want prosperity as well as democracy and liberty," Bitar says. "This is something Western nations need to realize. The way to help democracy blossom is to stop viewing the only alternatives for government in Arab nations as either repressive regimes or Islamist extremists. There's a middle democratic road, and Tunisia may now be on it." See more about the price of prosperity in Tunisia. See how scientists are keeping Africa's deserts at bay.